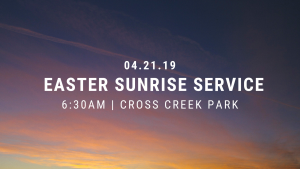 Join us as we commence the Easter celebration with an interdenominational sunrise service hosted by First Baptist Church – Fayetteville, NC on Anderson Street, First Baptist Church on Moore Street, and First Presbyterian Church Fayetteville, NC. Sermon delivered by Rev. Rob James, Pastor of First Baptist Church – Fayetteville, NC on Anderson Street. The offering collected will benefit Connections of Cumberland County. *In the event of potential inclement weather, service will be held in the First Presbyterian Church chapel.